It’s just what the name suggests — a diagram that depicts your merchandise display plan. It shows exactly where every product in your store should be placed. Before you can create a planogram, you first need to determine your store’s basic “framework” — an inviting and easy-to-navigate layout and fixtures that distinctly brand your store. That sets the stage for a psychologically satisfying shopping experience. Using a planogram rather than just “eyeballing” your display plan ensures efficient use of floor space and shelf space so you can sell more. If you have multiple stores that serve different demographics, you’ll want to tailor each store’s planogram accordingly. For example, you could devote more high-value space to gourmet foods in a high-income area, or increase facings of culturally-specific items where the neighborhood has a unique ethnic flavor. Products come in a multitude of colors, shapes, and textures. The way you arrange them is a key component of your visual merchandising. Aesthetics affect customer mood, and they draw the eye to specific areas or items. Placing related items near one another in a logical sequence increases shopper convenience and also boosts suggestive selling of additional, unplanned items. When you know where everything is supposed to go and can instantly see if there are gaps, you can keep shelves looking plentiful and inviting. Efficient re-stocking increases sales, prevents sales-deadening out-of-stocks, and improves inventory management, which also reduces costs. Plus, you’ll have a handy reference to recreate seasonal displays that were especially hot sellers. Store planning is more than simply making sure every product fits in the store, it's about appealing to your audiences, getting them to walk through your store, and stop to look at products that aren't on their shopping list. When creating your planogram, keep these visual merchandising techniques in mind. Position new and seasonal products at the front, to the right, as customers enter. Place best-sellers and featured items at eye level (or on lowest shelves to appeal to kids). Locate necessities in the rear, so shoppers have to pass by more exciting “optional” merchandise to get to them. Create “speed bumps” that catch the eye and cause shoppers to pause for a closer look. Multiple facings of a single product, especially if it’s boldly colored, can produce this visual effect. Don’t forget your cash wrap. It’s not only a workspace, it’s your store’s prime (and final) impulse purchase zone. You can sketch your planogram on a piece of paper, or use specialized software to create a diagram that is highly detailed and color-coded. It doesn’t have to be fancy, but it does have to be complete. Then, measure the packaging of each product or the dimensions of soft goods as they will be folded or hung. Together, these measurements will tell you how much product you can put in your display. Or, conversely, they will help you choose and arrange fixtures to accommodate the amount of merchandise you want to display. Whatever format you choose, remember that someone else will probably be using the planogram to stock and maintain displays. Include enough detail so they can do that easily and consistently. For example, you could include a legend showing exactly which merchandise is depicted. You can also create an overview planogram that shows how displays should be placed relative to one another. 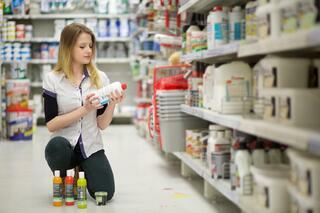 While a planogram ensures consistent product placement, it should be flexible, too. Re-evaluate it frequently, tracking what sells and what does not, so you can make adjustments. You don’t want to waste prime territory on weak-performing merchandise. Nor do you want to waste time frequently restocking a fast-seller. On the other hand, you do want to regularly freshen displays with new merchandise. Yes, creating a planogram is tedious. But it’s time well spent because you have only a few seconds to capture a shopper’s attention. Planograms help you do that most effectively.